Case Study: Enviro-Flo Trench Drain Installation at WestWorld Equidome - Jay R. Smith MFG Co.
All stadiums and arenas tend to get dirty, but when the City of Scottsdale decided to undertake a $42.8 million expansion of the Tony Nelssen Equestrian Center at WestWorld to enclose and climate control the Equidome, they had a unique problem. The venue’s arena floor is covered in dirt. Dirt that during the course of a show, horses’ hooves will be kicking up into the air. Dirt that floats through the air and up into the grandstand, covering the stadium seating and floors in a fine coat of dust. One might think people in dirt houses shouldn’t throw water, but that’s exactly what the WestWorld Equidome Arena employees do after each show. Thanks to the ingenuity of plumbing contractor Mark Coleman of Phoenix-based Coleman Plumbing, it turns out hosing down the stands is the fastest and easiest way to clean up without creating a larger mess. The challenge Coleman faced was how to capture all the water coming out of one and half inch fire hoses and washed down the stands heading straight for the dirt floor of the arena. If the water entered the arena, they would end up with a mud pit, and while that’s great for certain events, it’s a disaster for the kinds of events taking place at the Equidome. Coleman needed a way to capture all that water and dirt and get it out of the seating area quickly. He decided that installing standard floor drains into the existing concrete structure would not do the trick. Not only would water have to be directed specifically to the drains, but also they would not get rid of the water fast enough. There was the potential for mud to build up and clog the drain, resulting in an overflow situation. 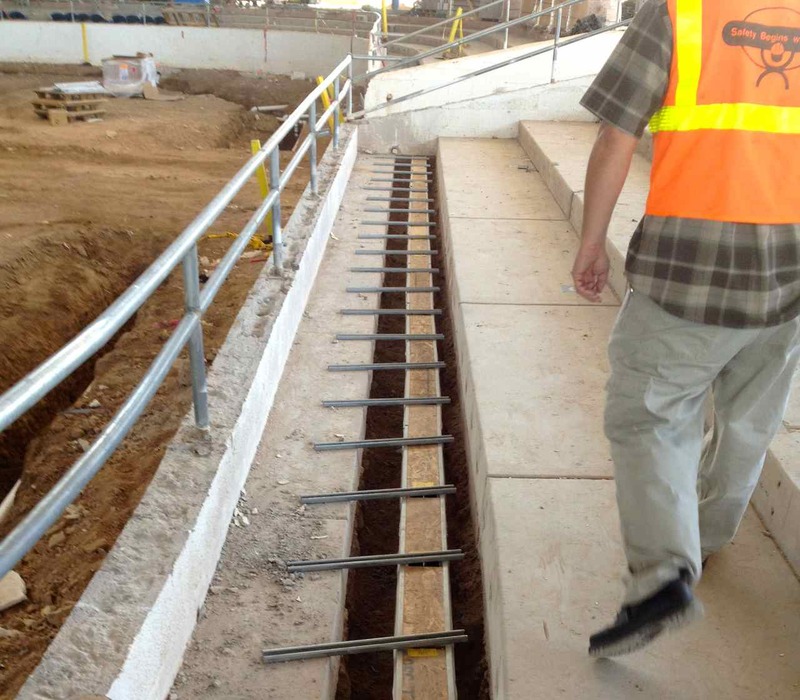 “We decided to install a trench drain system around the entire perimeter of the arena at the bottom of the existing seating area. I’ve worked with the Enviro-Flo on other jobs so I was familiar with the installation process and knew it was easy to work with,” Coleman said. This system would allow WestWorld employees to hose down the stands from top to bottom and from any point in the grandstand. He chose the Enviro-Flo from Jay R. Smith Mfg. Co. with a presloped (.6%) radius channel and smooth, uniform interior to handle the high volume of water and dirt. Water and dirt would flow down through the grandstand and go straight into the trench. The drains had the ability to deal with a rush of water and dirt moving down and out of the stands. The trench drains were able to capture the water and prevent it from reaching the dirt-covered arena. One of the reasons Coleman chose the Enviro-Flo was the cost savings due to easier installation. The lightweight, 100% polypropylene construction, along with the Enviro-Loc® mechanical interlocking joint and molded outlet connection, makes the Enviro-Flo contractor friendly. “It was a tough area to do the installation and there was a lot of ground to cover, but the fact that [the Enviro-Flo] didn’t move around at all made the job easier,” Coleman said. The new Enviro-Flo II promises to improve on the already easy installation process. The Enviro-Flo II now includes the standard rebar anchors that contractors have come to love. Furthermore, the new Rante-Arrow design enhances the installation process by allowing for side-to-side adjustment of the trench drain run. For jobs similar to the Equidome where the trench drains have to cover a lot of ground, the Enviro-Flo II will be available in 20 meter sloped and 20 meter non-sloped configurations. The tongue in groove connection will also speed up installation because it requires no screws or channel clips. The new channel insert, also made of post-industrial recycled material, allows the contractor to easily remove it after the concrete is poured. The project originally called for a fiberglass trench with a metal rail and cast iron grates in the horse stalls and wash-down areas. Coleman decided to use the Enviro-Flo with the poly grate there as well. “The metal rail and cast iron grates would have rusted or deteriorated over time from exposure to the horse urine. The Enviro-Flo can stand up to that,” he said. But this job wasn’t only about the mechanics. 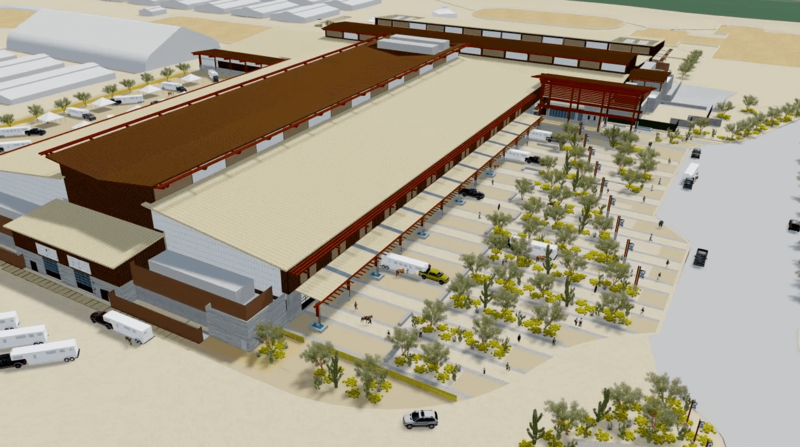 With some of the nation’s most prestigious equestrian events and events, like the Barrett-Jackson Collector Car Auction taking place at the Equidome, the City of Scottsdale also wanted a drain system that was aesthetically pleasing. Coleman said the Enviro-Flo had an added advantage because it was available in a choice of colors. The city chose a grey finish, which blended in perfectly to the surrounding concrete. Several events have taken place since the Enviro-Flo installation, and Coleman said the project has been a success and the drains are performing well as expected. Crews have been able to wash down the stands and the arena has stayed dry. To learn more about the Enviro-Flo and Eviro-Flo II and other Smith products, visit www.jrsmith.com.